Social Web App Platform (SWAP) was designed by developers at the Software R&D Center of Samsung Electronics. 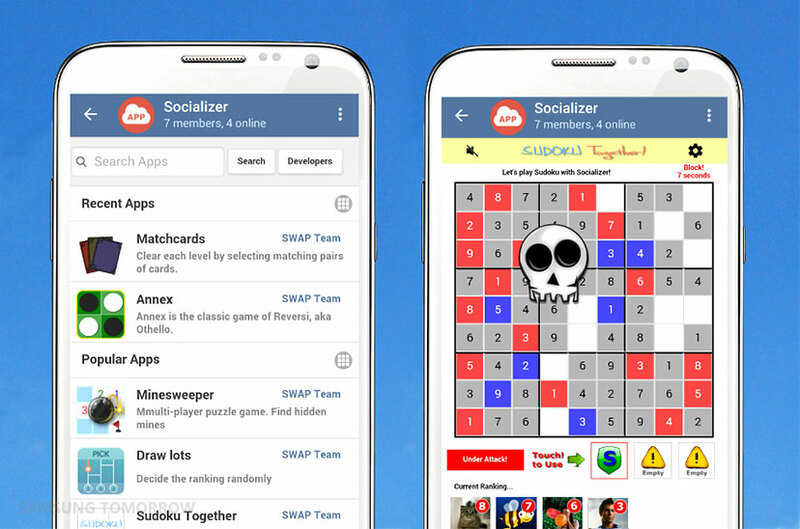 Socializer Messenger App is based on the open source project “Telegram for Android”, which allows web apps to be shared in a chatroom without additional downloads or installation, and runs on the Social Web App Platform (SWAP), a platform for developing, distributing and sharing social mobile web apps. With an intuitive search bar, it is easy to search for new and different apps for you and your friends to use. You can also sort the apps by recently used, most popular, and newest, to make searching even more convenient. Say goodbye to troublesome and complicated app installations. Apps designed for Socializer Messenger, built on the SWAP, just work. You can start them up from the chatroom, without any additional installing. With Socializer Messenger App, you no longer have to stop a game when someone wants to talk to you. Instead, just tap the Minimize/Maximize button to switch over to your chat, then tap again to switch back to your game. You can even move the Minimize/Maximize button around the screen to wherever you feel most comfortable. ① For Messenger Users – Quick and Easy! Existing instant messaging software has limited features—usually just the basics, like chatting and content sharing—and if users want to run games or utilities within the messenger, they need to install additional apps and sync them. Socializer Messenger App, however, is much simpler. With it, people can enjoy games and utilities in a chatroom without any additional setup. Currently, eleven basic apps, including games and utilities, are available and can be shared quickly and easily. Another convenient function is the dual-screen mode, so people can play a game, chat, and share the results of the game at the same time. Socializer Messenger can be ideal for content providers as it lets them construct their own app store and create a revenue model by encouraging in-app purchases or by displaying advertisements. With SWAP, providing content can be a separate service from the platform or messenger. It also ensures easy maintenance and after-sales service. Each mobile platform currently has an app store that dominates the market; however, being able to construct new app stores individually can be a game changer. Socializer Messenger App developers have also mentioned plans to form a new market using a web app-based search engine for those stores. It’s the hard work and enthusiasm of these humble developers that led to the creation of Socializer, an attempt to make a better messenger for users, developers, and content providers. They say that going forward, their goal is to bring the web app sharing feature to other messaging software, and hope that bringing in more talented programmers will lead to ever more apps. Why not check out Socializer Messenger App for yourself and see what all the excitement is about?